Note: This post and recipe were revised 3/11/2014. Got brisket? Great! Then you still have time to brine your own corned beef for St. Patrick’s Day. Why would you want to brine your own corned beef? Well, one reason might be that you can leave out the nasty nitrates or preservatives. Another reason is you would have better control over the flavor. Or maybe you have some beautiful grass fed brisket to use. I made my own corned beef for the first time in 2009, using a dry cure recipe from America’s Test Kitchen (Dry Cured Corned Beef and Cabbage). Since then I’ve made a lot of corned beef for the restaurant. Our corned beef hash was such a favorite, there was an uproar when we tried to take it off the menu. Nowadays I prefer to use a brine. We found submerging the meat completely in liquid typically yields more consistent results than a dry cure. The brine I like to use for corned beef is a hybrid between Michael Rhulman’s corned beef and pastrami recipes. Michael Ruhlman’s book Charcuterie is currently the best guide I’ve come across for all things cured and brined, and a great place to start for anyone interested the craft. I’ve used his recipes to make bacon, hams, pates, duck breast prosciutto, corned beef and pastrami. I will warn you that his brines tend to be on the salty side. For example, his corned beef recipe calls for 450g of salt per 4 liters of water. If you are sensitive to salt, you may want to reduce the salt to 350g, but I wouldn’t use less than that. Remember, the craft of charcuterie was meant for food preservation, so using a less concentrated brine may improve the flavor, but may also shorten the product’s shelf life. Pink salt is what keeps the corned beef rosy red when it’s cooked and gives it that ham-like cured flavor. It also acts as a preservative and helps to extend shelf life, so if you choose to omit it, I would suggest using the full 450g of kosher salt. The recipe also calls for pickling spice. You can use store bought, but if you love corned beef and pastrami as much as I do, I suggest making your own mix. By making your own, and only what you need for one recipe, you can experiment and adjust the mix to suit your taste. I also like any excuse to go spice shopping, especially at Kalustyans. A quick search through different cookbooks and the internet revealed several different recipes for pickling spice. They all start with equal parts mustard seed and coriander seed. Some contain an equal addition of whole black peppercorn, and all the recipes contain varying amounts of crushed red pepper or dried chiles, allspice, mace, cinnamon, bay leaves, cloves, and ginger. With whole spices, you will also get more accurate measurements by weighing them out. The mix included below is a good starting point. Lastly, it is also important to note that the recipe calls for a “flat cut”, or” first cut” brisket. The “point” or “fat end” cut is thicker, has a lot more fat and connective tissue, and would need over a week in the brine. 1. Combine all the ingredients in a 4 to 6 quart non-reactive (stainless steel or enameled) stockpot. 2. Bring the mixture to a boil, and turn off immediately. It’s important not to let the water evaporate or your brine may become too strong. 3. Cool the brine completely, preferably in an ice bath. If you cool it in your refrigerator, divide the brine into smaller containers so they cool more quickly. 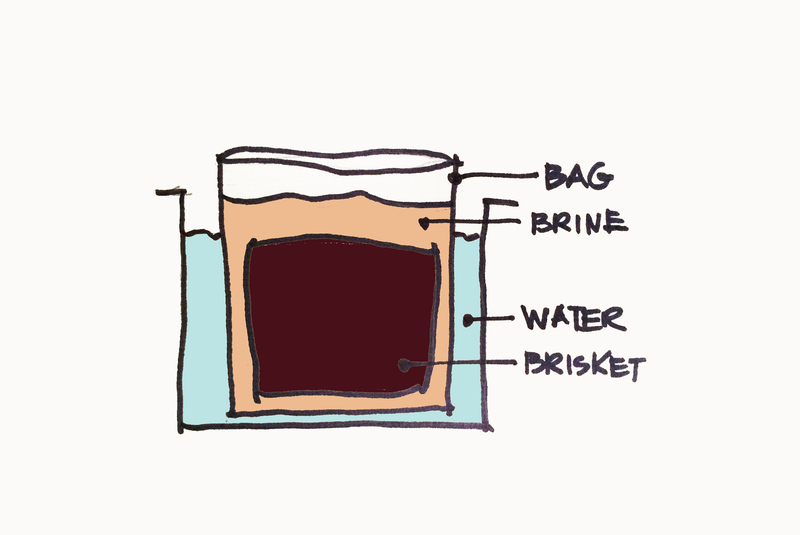 Method #1: In a container large enough to fit both the liquid and the brisket. If necessary, cut the brisket in half. Using a fork or metal skewer, evenly pierce the brisket 30-40 times on each side, submerge it in the brine, and weigh it down with a plate. Brine, refrigerated for 5 days. Method #2 (preferred): I find the best way to brine anything is in a gallon sized ziploc freezer bag. Cut the brisket in half, pierce 30-40 times on each side and place each half in one bag. 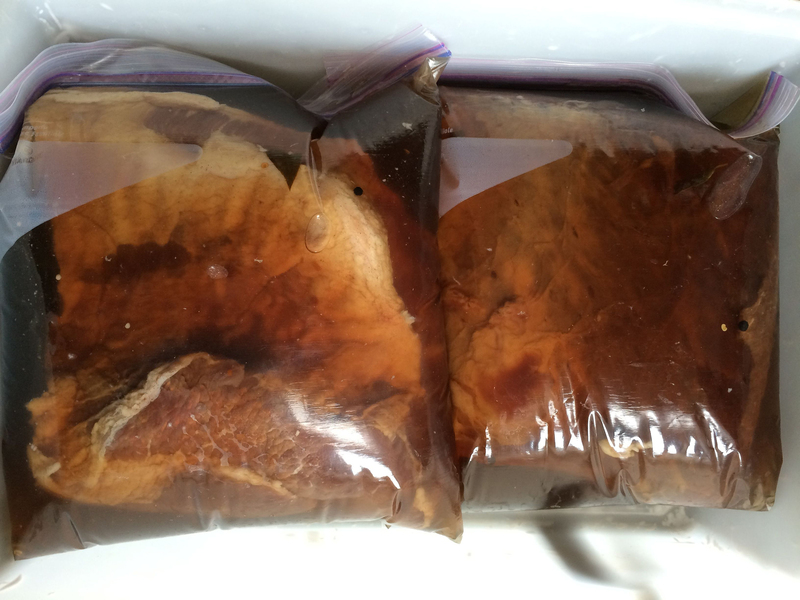 Fill each bag with enough cold brine to completely cover the brisket. Squeeze as much air out of the bag as possible, seal, and refrigerate. The trick to getting all the air out of the bags is to submerge most of the bag in water. The water pressure pushes the air out so you don’t have to, and frees up your hands to seal the bag. Place the bags are in a leakproof container, just in case. Brine, refrigerated for 5 days. There. Done. Join us next for some good old Corned Beef and Cabbage. Tags: Brine, Brisket, Cooking, Corned Beef, Food, St. Patrick's Day. Bookmark the permalink.